I'm developing a web application on a Mac and uploading to a Windows hosted server. I used to use Filezilla's directory comparison feature to see which files in a directory need to be uploaded to the server. But now, certain files are always shown in red (different). Worst example: if I upload a brand new file, it is immediately marked as different than itself. I assume this has something to do with the different ways Windos and Mac OS calculate file sizes - but I only experience this with certain file types: html and text. PHP files (even though they are essentially a text file), binary, images and PDFs all report the correct size. What is it in html files that gets their size misreported? Should I switch to using modification time as my comparison criteria? Set your Default transfer type to Binary and this shouldn't happen again. The problem is that the line endings are converted from UNIX to Windows line terminators. Thus the size difference. Not the answer you're looking for? Browse other questions tagged ftp filezilla or ask your own question. FTP from windows to linux using filezilla causes doubling of file sizes? 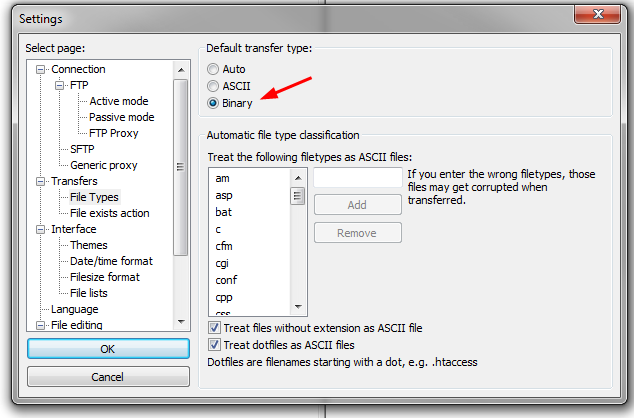 Why does FileZilla descend into a directory when deleting? How can I reliably synch local source files with a remote?